Mix cinnamon, ginger and chocolate and you will come up with a color very close to Burnt Sienna, (not to be confused with the rock band, Burnt Sienna). However, you may not want to paint with this mixture. For paint, you will need iron oxide and manganese oxide. Then you will have to set it on fire, unless or course, you are looking for the more yellowish Raw Sienna. In that case, leave off the fire. Burnt Sienna is an old paint color dating to early cave paintings.. The rose brown of Burnt Sienna was originally called terra rossa or red earth in accounts from the Renaissance period but later came to be known for the Italian city of Siena where the minerals were first mined. Today it is mined on the islands of Sardinia and Sicily, in the French Ardennes and American Appalachians. 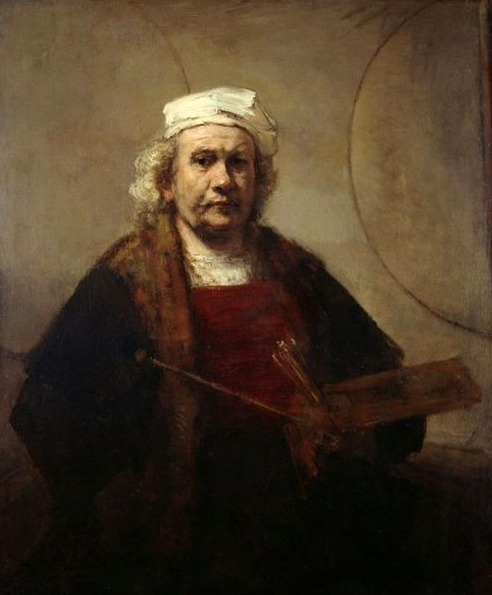 Rembrandt favored Burnt Sienna as is evident in the warm rosy glow so characteristic of his paintings. Burnt Sienna is favored in most Renaissance paintings as well. Caravaggio’s chiaroscuro was likely achieved with the liberal use of Burnt Sienna in the rich deep shadows that became his signature style. Burnt Sienna was a popular paint of many of the old masters and continues its popularity to this day. Most makers of Burnt Sienna today give a light fast rating of one as extremely light fast. Golden classifies it as semi-transparent. The Gamblin Company states today’s Burnt Sienna is more opaque than 200 years ago and recommends Van Dyke Brown or Gamblin Earth Tone Colors as better choices if seeking greater transparency. Daniel Smith, speaking of the watercolor, says Burnt Sienna combines well in glazes as a semi-transparent pigment that won’t “sully or stain the other pigments” in your glaze. Artists seeking to become more earth-friendly in painting can buy natural pigments of Burnt Sienna for home mixing from EarthPigments.com. If you would like to be more “Green” with your browns, try mixing your own earth tones from actual earth pigments. What could be more natural? Order natural pigments from Earth Pigments here. This entry was posted in art, Uncategorized and tagged Art, Burnt Sienna, Burnt Sienna Band, Caravaggio, chiarscuro, Daniel Smith Paints, Earth Pigments, Gamblin, Golden Paints, Paint, painting techniques, Rembrandt, The Painters Keys. Bookmark the permalink. I love the idea of mixing paints to get a different color. The professor once watercolored. Was never any good, but I still love and admire the art. I believe the Professor’s artistic talents lean more toward the literary and dramatic arts! Mixing paints is fun!!! I love Burnt Sienna, I have used it in many odd ways in my sculptures. I am looking forward to checking out the Earth Pigments…thanks for the history lesson. You’re welcome! I love the history of paints! Would love to hear about your experience with Earth Pigments. Happy sculpting!